Things are usually best when fresh, whether it's fish, or air, or Princes who antagonize their enormous uncles and occasionally consider cabs "rare". 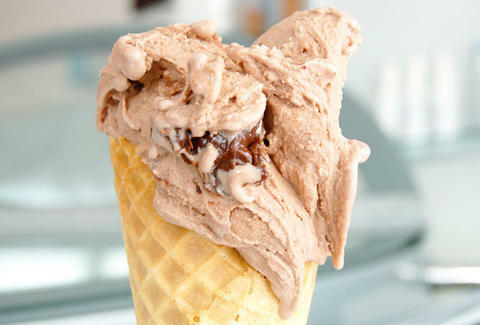 For a royally good gelato spot making it from scratch daily, hit Milani Gelateria. A tiny little shop that fits well with the old world vibe on Espanola Way, Milani's range of gelatos're concocted every morning in churners right behind the counter by Francesco (a Torino native who prefers to make his gelato in a less sweet, more "Northern Italian style"), who then scoops the goods from what looks like a big stainless steel roulette wheel -- so as Wesley Snipes would tell you, always bet on black (cherry). Flavors divide into "Cream" and "Fruit", with the former repped by stuff like Malaga (rum raisin made with a spiced rum); Hazelnut, using nuts from the Piemonte region of Italy (known as the best in their nation); and Pistachio, made with Sicilian nuts renowned for their robust character, and tendency to stab casino managers with pens. That "Fruit" group takes advantage of Florida produce, and includes Fragola with strawberries from the Redlands, Pesca with peaches bought locally and pureed before being mixed with the base gelato, Mela Verda (green apple), mango, banana, and lemon, which is freshly squeezed, but not freshmanly squeezed, like two almost-grown men sharing 120 square feet of dorm. Milani also makes specialty flavors like Dulce de Leche, After Eight (mint chocolate chip), Pere e Cioccolato (a pear flavored base drizzled with dark chocolate), and Fioro D'arancio, which is a creamy base with orange slices on top -- try them all, and you'll say you've had your Phil, unless your first name is Uncle.